With summer just around the corner, salmon burgers are a great way to welcome the season. This recipe uses a roasted veggie puree, egg and panko to give structure to the burger. Fresh dill, lemon and parsley add an invigoratingly fresh touch. The burgers can be cooked on a grill, in the oven or stove top. After an exhilarating New Years Eve with Phish, a hearty, healthy meal was in order. My freezer happened to have a pound of wild shrimp, and lobster tails were on sale. Paella became our New Year's Day destiny. I used a recipe by Tyler Florence, and substituted brown rice and fresh tomatoes and bell peppers. The recipe came out fantastic! In addition to Paella, I also created a low carb Paella Salad, using baby spinach, minced parsley, ground pepper and the different proteins in the paella. A small side of rice is included on the side. In my younger years, a bottle of tequila might not hang around my kitchen for very long. But I've had this bottle of Jose Cuervo Gold sitting my my cupboard for a couple years now (longer?) and I figured it was time to do something with it. I couldn't really picture me and the wife lining up the shot glasses, what with the kids needing to be fed and all, so I inebriated some shrimp instead. My older son has turned into a fairly adventurous eater. That is, at least he's willing to try new things even if the result is a resounding "bleccchh!" and a rush to get a glass of water. When we do find something he likes I try to work it into the regular rounds of home cooking and have had Crab Cakes on the list things to try at home for some time. So these were my first attempt and I basically winged it. I'm pretty happy with how they turned out and the fact that there was just one of the nine crab cakes left makes me think the boy was pretty happy, too. My brother lives in upstate NY (Rome, NY) and goes fishing every fall at Salmon River. This time of year, the salmon run up the river to spawn, and fly fishing is avid here. These salmon are in fresh water, and referred to as Steel-head. The main difference, aesthetically speaking, is that the meat is white, as opposed to pink. This is a fairly quick and easy recipe, since fish needs to be in marinade for as little as 30 minutes. Adapted from Weber's Big Book of Grilling. Mix all ingredients below, and marinade fish for 30 minutes or longer. 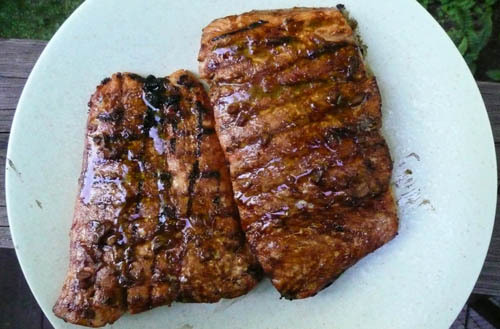 Remove fish from marinade, and reserve remaining marinade. Grill over INDIRECT high heat, for 10~20 minutes, depending on size of fish. During the last 5 minutes, brush remaining marinade on fish. I grilled directly on the (clean) grate, skin side down, and removed carefully with 2 spatulas when done. Eric said to put bacon in my stuffed clams, but not to use cheese. I too his pork-advice, but left a small amount of cheese in there for good measure. So, in part, this is his recipe, too. I recently changed jobs. 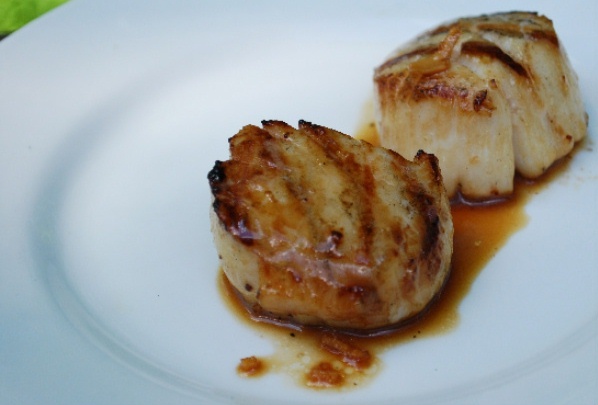 On my last day at my old job a co-worker asked me for a scallop recipe. We'd been eating lunch at a fantastic little place on west 19th street that served Japanese style chicken wings and it occurred to me that the sweet soy-based sauce they used on the wings would do well for some fresh sea scallops. To my constant dismay, my wife isn't a big meat eater. She'll eat a burger as long as there's "no red inside" and is pretty good about grilled chicken or chicken cutlets, but that's about it. This is particularly troublesome during grilling season which, as far as I'm concerned, is any day the temperature is above 50 degrees. Being the good husband that I am, I try not to deny her food. She'll eat most any fish and salmon is one of her favorites, so it makes a regular appearance on the weber. Sometimes I make it simply, with just a little olive oil, salt, and pepper. Other times I like to make it as follows, with an Asian marinade and glaze. The dominant flavors in this one are Soy, Ginger, and Lime. The salmon cooks up fast and is great as leftovers, too.